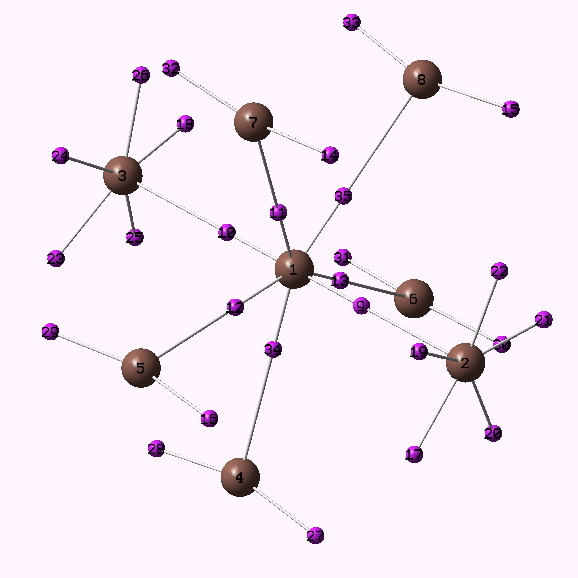 The Wiberg bond index (B3LYP/Def2-TZVPP basis+pseudopotential) of the central iodine comes out at 2.81; that of the two axial iodines is 1.05 and that of the five equatorial atoms is 1.50. Well, the axial iodines are clearly monovalent, the equatorial ones are higher because of I…I interactions around the 5-ring. The central iodine is clearly again, not hypervalent. 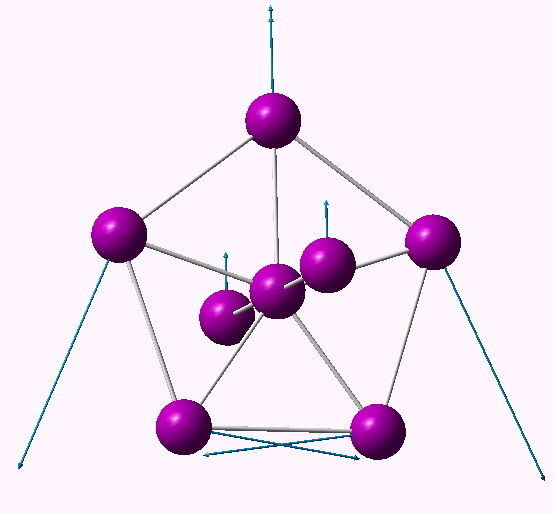 The individual Wiberg bond orders radiating form the central atom are 0.47 for the axial and 0.374 for the equatorial atoms. The I…I bond orders between the five equatorial atoms are 0.336 for adjacent atoms. This latter observation matches with the frequency analysis, since any individual I-I bond is already 1/3 formed, just asking to be eliminated. What of that other technique for finding electrons, ELF? All the I-I bonds radiating from the centre have well-defined disynaptic basins (the same is NOT true for e.g. IF7by the way, which comes out as ionic in ELF). The two axial covalent bonds have basins integrating to 1.35 electrons, and the five equatorial covalent bonds 0.77. 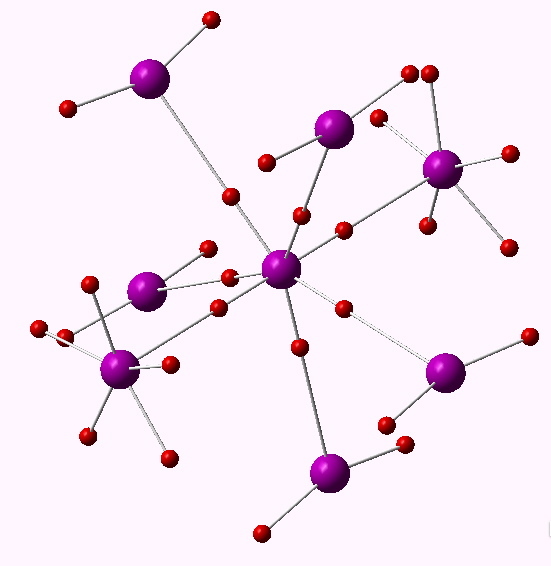 The central iodine has a total of 6.55 electrons in bonds surrounding it. The five equatorial iodines have 7.7 electrons in two lone pairs, whilst the two axial iodines have 8.05 electrons in five monosynaptic basins. In summary, all eight iodines in this compound exhibit valence shells filled with an octet of electrons. Now, beyond any ambiguity, we can say this is NOT hypervalent. Oh, for good measure, At8. The Wiberg index at the central atom is 2.77, the bond index is 0.46 for axial and 0.37 for equatorial At. The ELF basin integrations are 0.65 for equatorial, and 1.61 for axial, the former decreasing and the latter increasing compared to iodine. ELF analysis for At8. Click for 3D. This entry was posted on Saturday, October 23rd, 2010 at 9:50 pm and is filed under Hypervalency. You can follow any responses to this entry through the RSS 2.0 feed. You can leave a response, or trackback from your own site. Here is [so it appears] a real molecule like those above. Mazaki and Kobayashi, Tet. Lett., Vol. 30, No. 21, pp 2813-16, 1989, (DOI: 10.1016/S0040-4039(00)99132-9) describe a fluxional molecule in which one of the equilibrium structures has an SeSe4 moiety. It was probed by 77Se NMR. Fourth time lucky? Thanks Mark. And well spotted! It has inspired me to compute its properties and I will post shortly. It also reminds me of my post on allotropes of halogens, and Br4 specifically. As it happens, I will shortly be giving my first undergraduate lecture to students in four years, to the student chemical society at Imperial College. That will be on the topic of hypervalence, with the question “Is it the cheshire cat of chemistry?” I will certainly add this Se system to my slides! Hypervalency: Third time lucky? is licensed by Henry Rzepa under a Creative Commons Attribution-Noncommercial-Share Alike 3.0 United States License.